Typically, the average person uses less than 1% of his/her brain in the areas of learning, memory and creativity – just think what could be achieved if we all used 20%, 40% or even 100% of our brain? The more effectively an individual learns to use the brain, the more successful he/she will be. How do we learn a new concept? Research shows a dual nature in the working of the human brain in day-to-day situations. When learning a new concept, the two halves of the human brain perform different tasks. 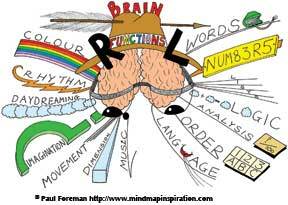 The LEFT BRAIN works to understand the logic, words, reasoning, numbers, linearity and analysis, while the RIGHT BRAIN interprets colour, images, rhythms and spatial awareness. Effectively using both sides of the brain increases productivity and memory retention. So, how do we use our left and right brain effectively? Concept map is one such solution. A concept map is a colourful, visual form of representing things. At its heart is a central topic of the chapter with the branches representing main ideas, all of which connect to the central idea. The article has been contributed by Butterfly Fields, a company working in the domain of innovative teaching learning techniques. To know more about the work the company does visit www.butterflyfields.com or call 040 2771 1020.